Nothing compares to cannabis crops grown under the sun. This summer, Top Shelf Grower has moved to a remote location to cultivate cannabis outdoors and off the grid. In this blog, you’ll find all the info you need to grow your own amazing outdoor marijuana and bring it to harvest by Croptober. Right now is the time to start growing cannabis outdoors. Summer has arrived, and even if you are reading this as late as August, you still have time to pull down a fat harvest in October. This season, I’ll be growing 10 plants from a total of 6 different strains. It’s a real blend of autoflowering and photoperiod dankness. Whatever your level of outdoor cannabis cultivation experience, now is the moment to take that bold step outdoors. If the sun is shining, you can use this blog to guide your ganja-growing adventure. Using simple methods, low-cost supplies, and with a little luck from Mother Nature, there’s a real prospect of raking in a couple of impressive harvests by the end of the season. I’m emailing dispatches like this one to RQS HQ using expensive and temperamental wireless technology from an off-the-grid fortified location somewhere in Spain. There are no locals—nothing but green fields, woodlands where the Sasquatch roam, starlings sing, and one crazy Irishman in the hillocks many miles from the nearest town grows weed. Oh, and a great big badass hawk that’s large enough to carry away a dog between his oversized talons. Cannabis cultivation—whether indoors or outdoors—should always be a discreet affair. You don’t need to completely drop out of society like I have to grow outdoors. All you need is a sunny, private space like a back garden or a balcony, really. But I value my privacy and won’t tolerate man or beast messing with my marijuana. A large rooftop terrace in the middle of nowhere is the perfect private place to grow weed trees outdoors. My grow commenced just a few days before the summer solstice on 21st June. Seeds were germinated using my old favourite: the paper towel method. I’ll be starting the seedlings on the windowsill in a homemade propagator fashioned from a 8l plastic water bottle. Inside, 7 of my 10 seedlings are housed, rooting in 33mm peat Jiffy pots. 3 more seeds are still between paper towels to complete the cannabis cast. During the first week of July, I’ll be busy potting-up. I plan to transplant the rooted seedlings directly into large white containers and move outdoors. Approximately 15 hours of sunlight per day should be enough for 4–6 weeks of vegetative growth. By late-July/early-August, as a natural 12-hour day nears, photoperiod varieties should begin to bloom, while autoflowers will be about halfway through flowering—concluding 6–10 weeks later with a staggered two-stage harvest of the autoflowers followed by the photoperiod varieties. Select strains suited to the local climate from only the best cannabis seedbanks. I carefully scrutinised the catalogues of both Royal Queen Seeds and Zamnesia Seeds for the most desirable specimens likely to perform well in the hot, sunny local climate. However, my prime objective for this marijuana mission is to grow some amazing purple weed again. Choosing a diverse blend of photoperiod and autoflowering seeds gives me the dank variety I require as a connoisseur, and ensures I’m not dependent on just one strain. Things can and will go wrong outdoors. I’m hoping for success, but planning for the worst—just in case. My high-class outdoor cannabis line-up is dank enough to make you drool. 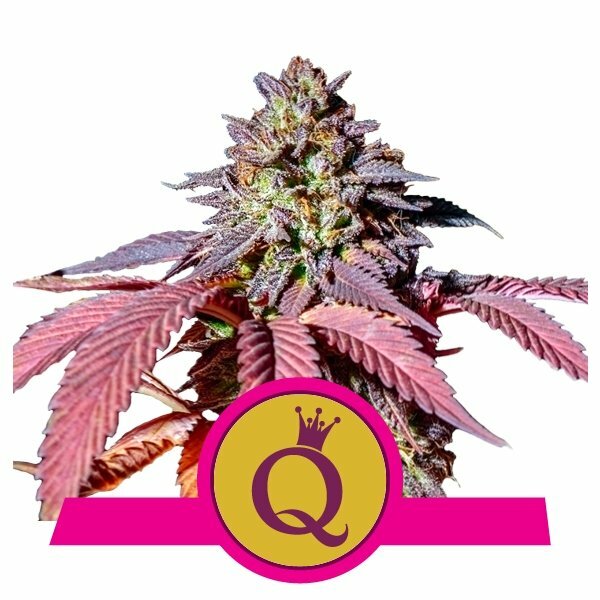 Representing RQS are 2 Purple Queens, 1 Royal Cookies Automatic, and 2 Royal Gorilla Automatics. The remainder are a mix of three of Zamnesia Seeds’ best: Bruce Banner #3, Blueberry Automatic, and Sticky Beast Automatic. Final containers for outdoor cannabis plants better be big if you plan on growing monster marijuana—so I’m dialling it up to 11, using a range of round, porous white containers in 15, 17, and 27l sizes. This summer, I’ll be employing a selection of both plastic and fabric pots. I’ve just purchased 150l of Top Crop Complete Mix, which is a lightly fertilised blend of peat, coco, and perlite, and 12l of extra perlite to increase drainage even more. And I’ll have to buy another 50l sack of soil to cover the 3 more beans I’ve just begun to germinate. Believe it or not, I lugged all of my ⅔-full bottles of Advanced Nutrients all the way in buses, trains, and taxis into the wild without spilling a drop. I got a bottle of Sensi Cal-Mag online to go with my three-part pH-Perfect Grow, Micro, and Bloom base nutes. And I’ve still got the same supplements Rhino Skin, Sensizym, Big Bud, and Bud Candy to see the plants through every stage of the life cycle. In addition, I also have acquired quite a stash of Easy Boost time-release fertiliser to blend with a few pots worth of soil. This way, I can stretch my nutes and feed a few of my cannabis plants by just adding water. If you are starting later in the season or expect patches of inclement weather at some stage during cultivation, it’s wise to invest in a greenhouse. A sudden summer thunderstorm or treacherous weather in autumn when you’re days away from harvest could be devastating. I plan to order a simple PVC greenhouse from Amazon with the same dimensions as a large grow tent in the coming weeks. It even has poles and joins just like a grow tent, in the same familiar 2.4 × 1.2 × 2m dimensions. As added bonuses, the greenhouse will allow me to use the shelves to make a trellis for the 4 photoperiod plants, and the green tint of the PVC makes the garden even stealthier. I might not even use it. But for €50, I have a sanctuary for my plants during autumn rain and scorching summer sunshine. Cable ties, gardening wire, soft plant ties, plant support stakes bamboo/plastic, plastic pipettes for measuring nutrients, trimming scissors, spray bottle, and labels for pots. Getting your complete kit together will take up to two weeks. Granted, I’m in a remote location so I can hardly expect next-day deliveries. Regardless of where you are based, don’t leave deliveries to the last minute. Do some digital window shopping and you might even find some great discounts on many of the supplies you need. I got a free vaporizer with my last order over €100 from the online grow shop. My outdoor cannabis adventure has only just begun. Over the coming weeks and months, I’ll be documenting my outdoor cannabis crop all the way from seed to harvest. More grow reports, strain reviews, and a new YouTube video series documenting all the action are already in progress. Check the RQS website regularly for more outdoor cannabis blogs soon.